The season hasn't even started yet and the Toronto Blue Jays are already having injury trouble. 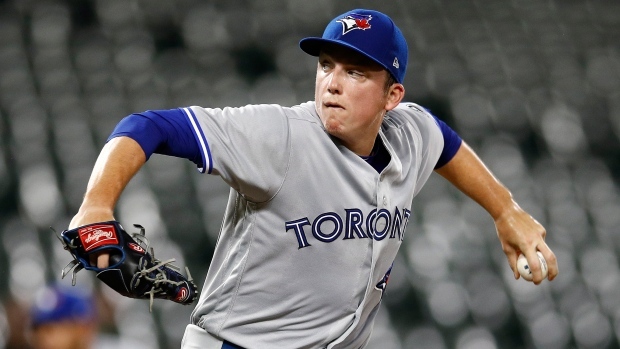 Manager Charlie Montoyo told reporters Saturday that lefty starter Ryan Borucki is experiencing elbow discomfort and won't be ready for the start of the season. #BlueJays starter Ryan Borucki had to leave a minor-league outing this week with elbow soreness. Will miss at least one regular-season start, Montoyo says. Pannone, Gaviglio, Reid-Foley, Thornton all candidates to fill in (assuming it's just a fill-in role). He is expected to miss at least one start and begin the season on the injured list. Borucki missed the entire 2013 season after having Tommy John surgery and was also limited to three starts in 2015 because of bone spurs. Borucki met with reporters after the news was announced Saturday and said he isn't overly concerned about missing an extended period of time. Montoyo added that Thomas Pannone, Sean Reid-Foley, Trent Thornton and Sam Gaviglio are four candidates to assume a starting spot. In 97.2 innings in his rookie season last year, Borucki went 4-6 with an earned run average of 3.87. Injuries have been a theme for the Jays of late. Relievers John Axford and Ryan Tepera are expected to miss time with elbow injuries, while outfielder Dalton Pompey has a "not necessarily mild" concussion according to general manager Ross Atkins. The Blue Jays will begin their season at home next Thursday against the Detroit Tigers.